Wondering where are the best destination in Thailand? Here are some suggestions of UME Travel to most popular destinations for over 90% new comers, best and different choice for Thailand tour. Well-selected cities of the whole Thailand and among them are the top 10 places to visit in Thailand. Phuket Island is known as the "the Sea Pearl on the Andaman Sea " and it is the largest island of Thailand. 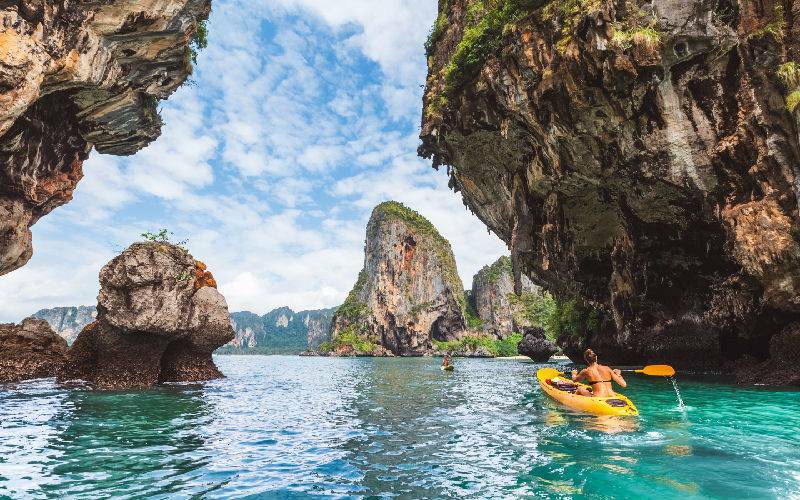 Phuket Island enjoys a very convenience geographical location, it is easy to go to Phang Nga Bay, Surin and Similan Islands and Phi Phi Island. Around the Phuket Island, the Racha, Coral Island and Khai Nok Island etc. is also perfect places for snorkeling, swimming and sunbathing. On the Phuket Island Inn, there are various hotels, resorts, bar streets, theme parks, shows and other entertainment facilities for your choice, each one will find a suitable tour and you will never feel bored in Phuket, so that it is very suitable for family travel. If your Thailand tour is during November to June, Similan Islands is a must-see attraction around Phuket. It is limited open only between Nov. to Jun. to protect its natural environment, which make it precious and more mysterious. Here her beautiful marine life and coral reef are protected very well so that it becomes a world-class diving resort. Koh Samui is located in southeast of Thailand and it is the third largest island of Thailand. It win the reputation of "Coconut Island" for the thickly planted coconut on the island. Around Koh Samui are the diving heaven - Ko Tao, and the top choice of full moon Party - Ko Phangan. 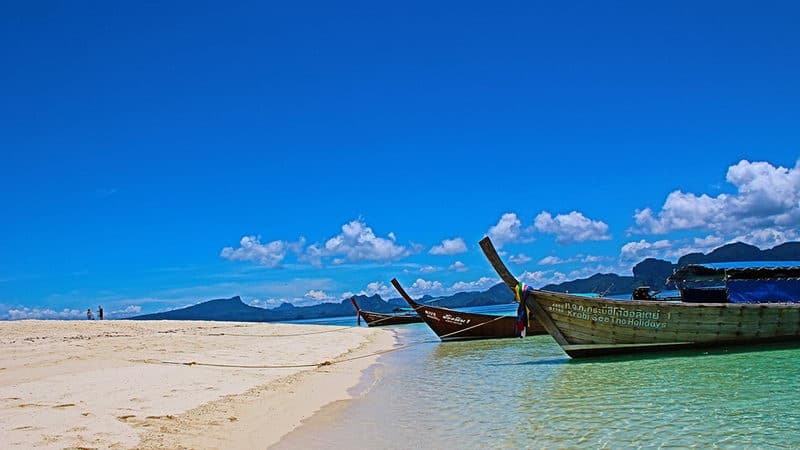 Surrounded by more than 40 islands of the Ang Thong National Marine Park, each of them is very close and easy to reach another, Koh Samui is the perfect paradise for island hopping tour. However, it does not as popular as Phuket because in addition to the rainy season in May and October, Koh Samui is also affected by the monsoon climate from November to January so the best travel time in Koh Samui is only from February to June. 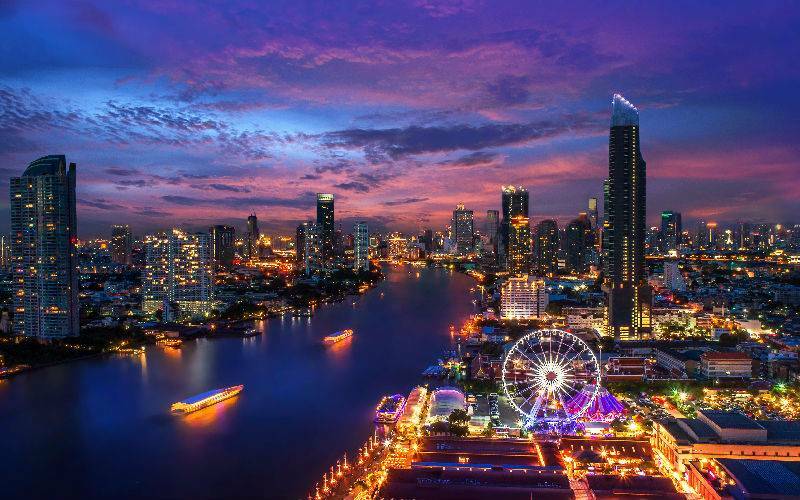 Bangkok is the capital of Thailand and the second largest city in Southeast Asia. Bangkok is praised by Thai the "city of angels", at the same time it is also known as the "capital of Buddhist". The "Mother River" of Bangkok - the Chao Phraya River makes Bangkok the "Oriental Venice" reputation with heavy water traffic. Bangkok is a magic combination of ancient and modern, noble and approachable, indulgence and disciplined. Here you can clearly feel the time interleaved with collision: you can visit the national history, art and culture - The Grand Palace and Wat Pho, you can also feel prosperous and crowded noisy in the modern business center; you can enjoy the convenience and intimate service in world-class five-star hotels while you can also enjoy sample the authentic and delicious roadside snacks; you can indulge in the debauchery of nightclubs in Nana square, you can also feel spiritual emancipation in the mahatta meditation courses. Chiang Mai is the second largest city in Thailand, with its developed degree only after Bangkok. Compared with the bustling capital of Bangkok, Chiang Mai has a completely different temperament: fresh air, tranquil city, close to the natural. 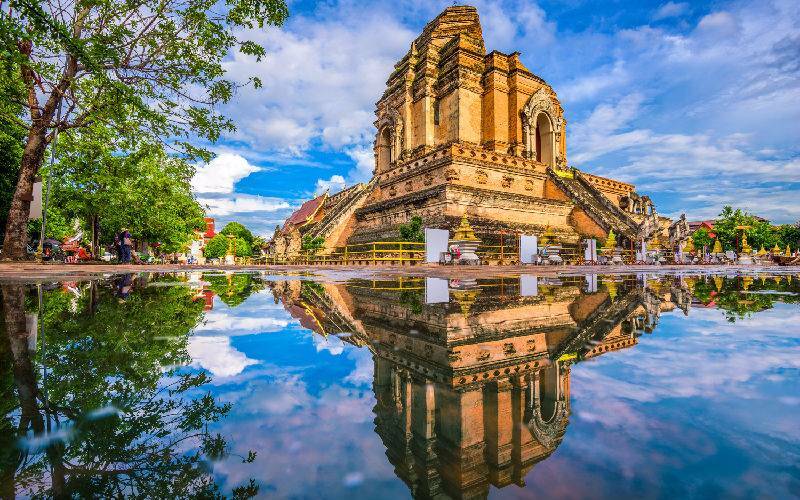 With the accumulation of hundreds of years or more heavy cultural foundation, Chiang Mai is known as the "Rose of the north". This name is also used to praise the beauty of Chiang Mai, most of beauty queen of Thailand come from Chiang Mai. The handicrafts of Chiang Mai also famous throughout the world with its elegant, exquisite technique. In Chiang Mai city, a lot of antique temples and palaces spread along the old street. Magnificent and unique northern pagoda, white walls, chic red roofs, golden eaves gleam and integrated with each other under the sun of northern Thailand. In the temple monks and local residents are modest and friendly and they are very welcome to have a discussion about Buddhism and the history and culture of Chiang Mai with tourists. 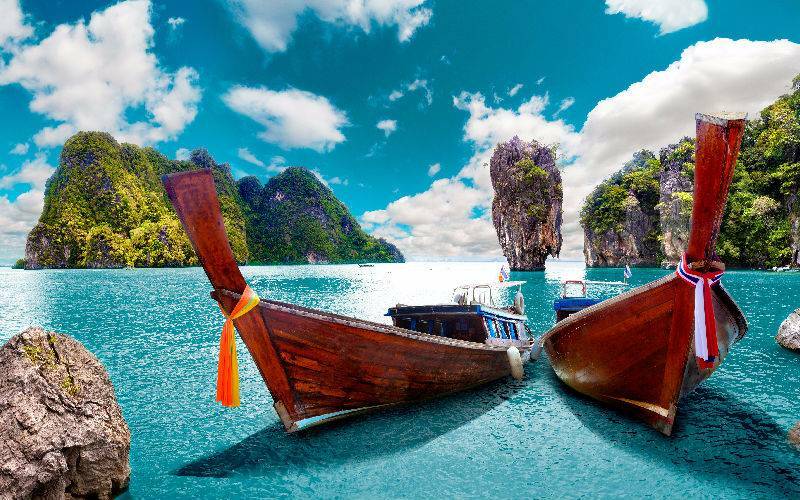 Krabi is located in the south Thailand, about 80 kilometers from the Phuket Island. 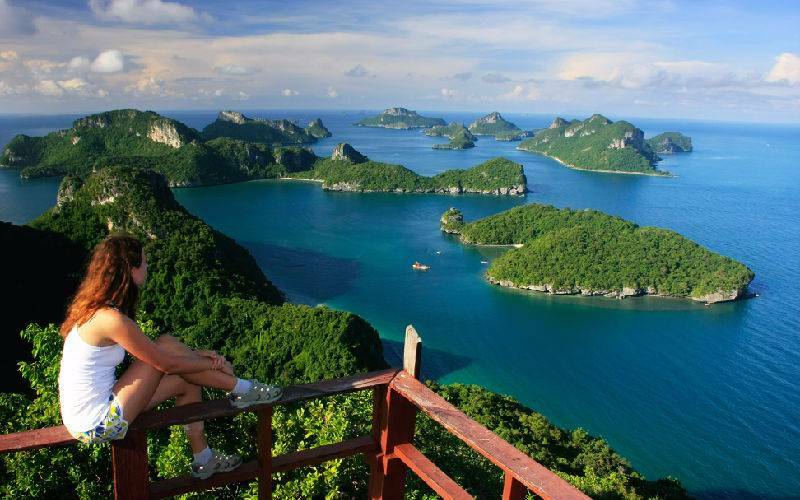 With more than 30 offshore lands around Krabi, it is just like a tropical paradise in Krabi peninsula. The beautiful white and soft sand, warm clear water, swaying palm trees, waterfalls flow upon the vast, wild animal everywhere give Krabi the incomparable reputation among beaches of Thailand. Among its islands and national park, the outstanding one is the Phi Phi Island which was the film location of The Beach and Leonardo DiCaprio acted the leading role. Krabi is famous for its jagged and splendid limestone. Here is the lava area, the mountain out of the sea and forms in different poses and with different expressions by people's imagination. In addition to the limestone scenery, an experience of rock climing is also fun upon the clear blue sea. Riley, not far from Krabi, has a steep limestone cliff and it is the ideal place for rock climbing with more than 500 climbing routes, so you can challenge the limits of your own there.